500 weekly food packages to poor families. Tomche Shabbos assists community members who are struggling financially, providing food packages, humanitarian grants and job training, as well as other support through various programs designed to offer emergency intervention and the hope for a better tomorrow. Volunteers prepare and deliver the packages. This is the only food many families eat. Enjoy your Shabbos meals knowing that a poor family is doing the same because of you! Years ago, people would invite poor and hungry people to join at their celebrations. Changing times has put an end to this beautiful custom, but you can still have poor people rejoice with you, as they receive your generous contribution during the time of your celebration. Please join us. We need your help. The Emergency Food Fund arranges deliveries of essential food items to hundreds of impoverished families in Rockland County. 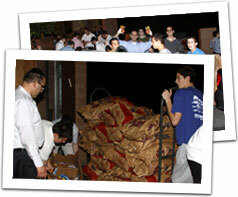 Enjoy your Shabbos meal knowing that a poor family is doing the same thanks to your generosity!